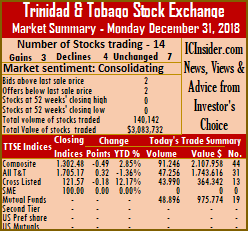 Trading ended on the Trinidad Stock Exchange on the last day of 2018 with modest changes to the three main indices, leaving the All T&T Index down for the fifth year in a row. At close of the market, the Composite Index fell 0.49 points to 1,302.48 and rose just 2.85 percent for the year. The All T&T Index gained 0.32 points to 1,705.17, but had a modest decline of 1.36 percent for the year, the market in 2017, closed down 4.08 percent, while the Cross Listed Index fell 0.18 points to close at 121.57 but rose 12.17 percent for the year, well off the 36 percent rise in 2017. The market closed with 14 securities changing hands on Monday, against 13 on Friday and finished with 3 advancing, 4 declining and 7 remaining unchanged. Trading ended with 140,142 units valued at $3,083,731 compared to 336,690 units valued at $6,885,454 on Friday. IC bid-offer Indicator|The Investor’s Choice bid-offer ended with 2 stocks with bids higher than their last selling prices and 2 with lower offers. Stocks closing with gains| Guardian Holdings closed with a gain of 10 cents and settled at $18.10, in trading 665 units, Massy Holdings gained 10 cents and ended at $47.10, after exchanging 11,058 shares and Unilever Caribbean rose 5 cents and completed trading at $23, with 6,107 stock units changing hands. Stocks closing with losses| Calypso Macro Index Fund lost 50 cents in trading 700 shares to close at $15, Clico Investments fell 16 cents and completed trading at $20 with 48,196 stock units changing hands, Sagicor Financial closed with a loss of 45 cents and completed trading of 7,516 stock units at $9 and Trinidad & Tobago NGL shed 15 cents and ended at $29.10, after exchanging 25,660 shares. 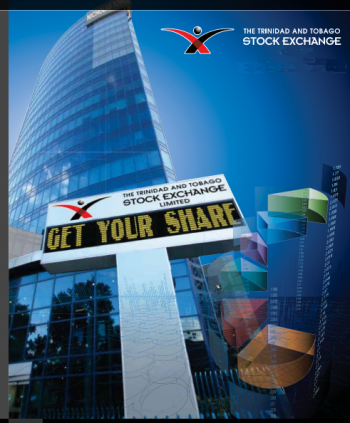 Stocks closing firm| Agostini’s ended at $23.40, after exchanging 100 shares, Grace Kennedy completed trading at $2.90, with 2,551 stock units changing hands, National Enterprises completed trading at $8, trading 101 stock units, NCB Financial Group closed at $8.50, after exchanging 33,923 shares. Republic Financial Holdings ended at $107.26, after exchanging 1,073 shares, Scotiabank settled at $64.25, with 1,000 units changing hands and West Indian Tobacco settled at $95.25, after exchanging 1,492 units.